ValveWorks® - It Simply Works with ValveWorks! ValveWorks® is a state of the art FREE program/utility, offering sizing & selection solutions for Globe & Rotary control valves based on ISA 75.01, a proven International standard. Now with basic application information, you can see exactly which control valve will provide the accurate control needed, and clearly identifies how well specific choices will perform in the application with no guess work. We can no longer be casual about our energy resources. Millions of control valves are in use today and If each one had been accurately sized, the energy savings would have been enormous. You now have an opportunity to correct that attitude. Control Valves can now be sized accurately for optimum control, providing minimal energy losses and maximum life expectancy without excessive maintenance. Assumptions that might have been acceptable before now are answered precisely in the ValveWorks® program. BTU demands are no longer estimates. Performance of the valve over the full range of control is graphically shown. 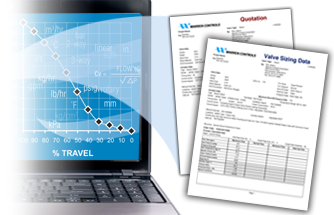 All resulting sizing and proposals can be printed for a permanent record. 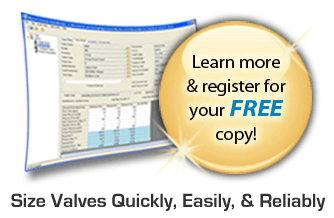 Please register to receive your FREE access to ValveWorks® today. For those not confident enough to use ValveWorks®, or perhaps you simply do not have the time and simply want some immediate help with a project, we will gladly do the work for you. All that is required is some basic information about your application and process conditions. You may not have all the information right now but fill out the appropriate worksheet to the best of your ability and if we need more information to proceed we will contact you. This 2 1/2 day factory training session is designed with the selling professional in mind. Indeed the prospective student will learn our entire product line from top to bottom. Sales training is included but there is so much more. 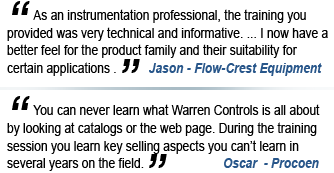 In depth training about all types of valves (beyond those made by Warren Controls), their uses and applications galvanizes and rounds out the student's overall knowledge about the world of valves. We discuss a myriad of pitfalls and troubleshooting as well as hands on experience. A knowledgeable, helpful and useful sales person will be one that is called upon and relied on by the customer. Check our Schedule for Upcoming Sessions. There is no charge for the training and space is limited. Training is only available for valid reps and distributors of record.